The sandal is the simplest form of foot covering, consisting of a sole held to the foot using a configuration of straps. Sandals can be utilitarian and bought from a street vendor in Bombay for a few rupees, or a work of art, designed by Manolo Blahnik and selling for several hundred dollars from a high-end boutique. Sandals have been made from every possible material-wood, leather, textile, straw, metal, and even stone, and have graced every echelon of society in almost every culture of the world. Sandals are the oldest and most commonly found foot covering worldwide. Archaeological examples, uncovered from the Anasazi culture of the American Southwest, date back 8,000 years. These plaited and woven sandals provided a flexible protective sole and utilized a simple V-shaped strap. Sandals are most commonly found amongst the peoples of hot climates where searing sands and rocky landscapes, inhabited with poisonous insects and thorny plants, necessitated the development of the most basic form of foot covering. Hot, dry climates generally precluded the use of a closed shoe or boot, something that would develop in colder, wetter climates. However, historically, sandals are not found exclusively among the peoples of hot climates. In Japan, geta, wooden-soled sandals, are worn with fabric socks called tabi that keep out wetness and winter's chill. Similarly, natives of Eastern Siberia and Alaska wear fur boots that originated in antiquity as sandals tied over fur stockings. At some time in history, the fur stockings were sewn to the soles, creating a boot, but the sandals' straps remained, sewn into the sole seam and tied around the ankle. While most sandals made for the global market of the early 2000s are usually manufactured of synthetic or recycled materials, such as tires, some indigenous materials are still employed for local markets. In India, water buffalo hide is commonly used for making sandals or chap-pli for the Indian marketplace. Metal and wood have also been used in India to produce paduka, the traditional toe-knob sandals of the Hindu: the soles were often stilted, limiting the surface area of the earth trod, protecting the tiniest and humblest of life forms. Similar stilted wooden-soled sandals can be found in Pakistan, Afghanistan, and as far west as Syria and Turkey, although the knobs are replaced with straps ranging from embroidered fabric to simple twisted fiber loops. Syrian wooden sandals, often inlaid with silver wire and mother-of-pearl, were dubbed kab-kabs after the sound they make when being walked in. Although the use of these styles is not influenced by Hinduism, their origins were most assuredly from the Hindu toe-knob sandal. North African and Middle Eastern nomads developed various inventive sole shapes to allow for better movement in desert terrains. The sub-Saharan Hausa used sandals with large soles that extend well beyond the foot, while curved soles were utilized in Uganda, and rolled toes were developed in Arabia. In more humid climates, sandals were preferred for their cool breathability. Ancient Aztecs and Mayans of Central America adopted a thick-soled sandal with a protective legging attached at the heel, while the top of the foot and shin remained exposed. Western culture traces the origins of the sandal from ancient Egyptian tombs, the earliest evidence dating from around the period of unification, about 5,100 years ago. A frieze in the Cairo museum depicts the Pharaoh Narmer followed by his sandal bearer, suggesting the sandals were a symbol of the pharaoh's sovereignty. This is under-scored by the ancient Egyptian practice of placing the Pharaoh's sandals upon his throne in his absence. Sandals were status-oriented for the elite, beginning with the pharaoh and working down the ranks of society throughout the Egyptian dynastic period, so that by the period of Roman occupation around 30 B.C.E. all but the very lowest of society were permitted to wear footwear. However, it appears that the wearing of sandals still remained an occasional one, reserved mostly for outdoor wear, especially while traveling. The vast majority of ancient Egyptians never wore footwear. Most Egyptians with status never wore footwear inside the home and in fact it appears that the Pharaoh himself did not regularly wear footwear indoors until the late dynasties, about 3,000 years ago. It is also evident that in the presence of a higher-ranking individual or deity, removing one's sandals exhibited deference. Sandals were often metaphors for the journey into the afterlife-either real (those worn by the deceased in life) or models made especially for the tomb. The earliest examples dating back more than 4,000 years are most often life-size models made of hard wooden soles, suggesting that in death the objects were symbolic or made available to those who did not wear footwear in life. Newer tombs, aged 2,000-2,500 years, reveal everyday footwear, including styles with coil-woven soles similar to modern espadrilles. When Alexander the Great united the Greeks in the fourth century B.C.E., the resulting society was one of great wealth and leisure that developed the arts, sciences, and sports under a democratic system. The Greeks also developed many different types of sandals and other styles of footwear, giving names to the various styles. Fortunately the Greeks kept thorough records, thereby giving accurate descriptions and references to the various styles of footwear and what those names were. This is indeed fortuitous as archaeological examples of Greek footwear are nonexistent, and historians must work from these descriptions and from those styles portrayed in surviving artwork. There were strict rules as to who could wear what, when, and for what purpose. Sandals used during the early Roman Empire were very similar to the Greek styles and even followed the same precedents set for restricted use according to the citizen's rank in society. Like the Greeks, the Romans named the various styles, and in fact, "sandal" comes from its Latin name sandalium. As the Roman Empire grew to include all the kingdoms held by Greece and Egypt, the Romans then continued their forays into northern Europe. The caliga, a military sandal with a thick-layered leather and hobnailstudded sole was named from the Greek kalikioi. The young Caius Caesar was nicknamed Caligula after this style of sandals which he wore as a boy when he would dress up as a soldier to stay in military encampments. The caliga protected the feet of Roman centurions on the long marches into northern Europe. However, the northern European climate, with its mud and snow, made it necessary for Roman invaders to adopt a more enclosed shoe style, beginning the decline of the sandal in the classical period. As the Empire's strength diminished after the second century C.E., so did the quality of manufacture of footwear. Statuary, as this is more plentiful than actual extant examples of Roman footwear shows simple V-straps utilized on sandals. These are far less complex than the strap arrangements in use when the Empire was expanding and at its greatest. In the seventh century the Christian Roman Empire, based in Constantinople, decreed that bare toes were immodest in mixed company. The sandal all but disappeared for the next 1,300 years, remaining in constant use only in cloistered monastic orders. Although gone, sandals were not forgotten. Artists portrayed sandal-wearing classical figures in biblically themed frescoes during the Renaissance, and sandals were worn by actors portraying historical figures in theatrical presentations. After the 1789 Revolution, the new French republic looked to ancient Greece and Rome for inspiration; along with classically draped garments, the sandal made a brief return to the feet of fashionable women. 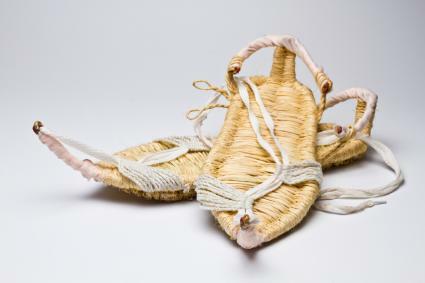 By the 1810s, a closed-shoe style, resembling a ballerina's slipper with crisscrossed silk ankle ties, became fashionable, and although no toes were exposed and technically the style was not a true sandal, the long ties did suggest a classical association, and the shoes were commonly referred to in period literature as "sandal-slippers." The Empress Eugénie is depicted wearing toe-baring sandals in a photograph taken in the 1850s, but this was not to be a successful attempt at reintroducing the sandal as a staple into the fashionable woman's wardrobe. Propriety kept men's and women's toes hidden even on the beach, where bathing sandals consisting of cork-soled cotton closed-toe shoes with crisscrossed laces, first adopted in the 1860s. Similarly another classical revival in fashions brought about the sandal-boot for women. This was a closed-boot style, but cutouts in the shaft exposed the stocking-clad leg beneath. This style of boot first appeared in the late 1860s and remained fashionable into the early years of the twentieth century. It was back at the beach in the early twentieth century where bathing sandals and boots gradually bared more of the ankle and instep. During the late 1920s, women donned beach pajamas for the poolside or at the beach. These loose-fitting pantsuits were paired with low-heeled sandals made of wide leather or cotton straps. It was a short jump from poolside to the dance floor in the early 1930s, where under long evening gowns, high-heeled leather and silk sandals permitted feet to remain air-conditioned for long nights of fox-trots and rumbas. By the late 1930s, the sandal was a fully reinstated necessity in a fashionable shoe wardrobe and included styles for all times of day. World War II inadvertently aided in the reestablishment of the sandal as certain materials, such as leather, were rationed for civilian usage. Sandal straps require less leather in their production than an enclosed pump, and summer sandals made up of twisted and woven fibers and other nonrationed materials were available without coupons on both sides of the Atlantic. By the 1950s, many European men were wearing sandals for casual wear but most North American men considered them too effete. Women's evening sandals in the 1950s used the barest of straps to give the illusion of no footwear at all, as if the wearer was walking on tiptoe. The vamp strap-sandal style, also known as an open-toe mule, created a similar illusion, although quick steps proved impossible without losing a shoe in the process. American shoe designer Beth Levine solved this issue with the addition of an elastic web running the length of the insole. This innovation was called a spring-o-later. In the late 1960s hippie anti-fashion introduced the most basic sandal style to American streets. Dubbed "Jesus" sandals, these simple leather toe ring or V-strap sandals were imported from Mexico and Asia, or made up locally by fledgling street artisans. Gender neutral, this sandal embraced naturalism, comfort, and ethnic-inspired style. This paved the way for the introduction of "health" sandals into the fashionable wardrobe, such as Birkenstocks in the 1970s. Contoured insoles and minimal curtailing of the foot were touted as perfect aids to foot health and comfort. While high-fashion sandals have remained a staple in women's wardrobes since the 1930s, men's sandals have never achieved a place beyond the beach and casual wear. However, boundaries have been crossed in recent years. Sport sandals, introduced in the 1990s, transcended the sandal into a foot covering suitable for a variety of sports activities by including a synthetic rubber-treaded sole. 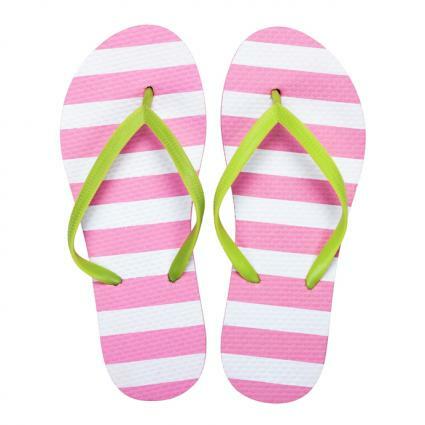 And the simplest of colored rubber flip-flop thongs, intended for basic seaside foot covering, has even made it into the pages of Vogue and other au courant fashion publications, gracing the feet of well-dressed models in clothes deemed suitable for a day of shopping on Fifth Avenue or the Champs Élysées. See also Boots; High Heels; Shoes; Children's Shoes; Men's Shoes; Women's Shoes.